Made any French bread lately? I’m not talking about a baguette, but about the original French bread — the huge, heavy, country sourdough round known as a miche. 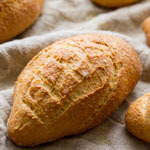 With its dense crumb, tangy flavor, and thick, dark, chewy crust, a miche is about as far from a baguette as you can get, and it was the staple bread in France long before the white-flour interloper arrived from Vienna in the mid-19th century. Miches can be scored in a variety of ways, including a diamond pattern, a simple box score, or an initial. Because its top is rather flat, a miche also serves as a nice surface for a flour stencil (the ones in the bottom right photo — Golden Gate bridge and cable car — are from our SFBI graduation party). I experimented with a different surface embellishment. 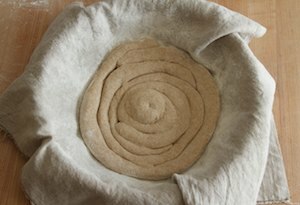 The spiral pattern is not scored; rather, I used about 500 grams of the dough to roll two or three ropes, about an inch in diameter, that I coiled in the bottom of a 10.5-inch flat-bottomed, linen-lined and floured basket. 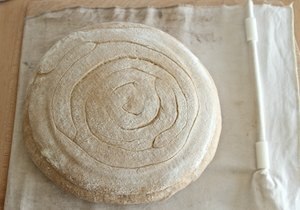 Then I shaped the remaining dough into a boule and laid it, smooth side down, onto the coil, making sure all the loose flour on the dough was brushed away so the two parts would not separate during baking. In a bowl, combine the starter ingredients. Cover and let rest for 8 – 12 hours, until at least doubled in size. In the bowl of a stand mixer fitted with a dough hook, combine all of the final dough ingredients except about 10% of the water. Mix in low speed to incorporate all of the ingredients, adding more water as needed to achieve a medium dough consistency. Continue mixing in low or medium speed to a low-medium level of gluten development. Turn the dough into a lightly floured counter. 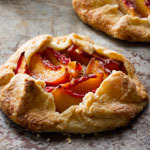 Shape the dough into a round, or a spiral-topped round as shown above, and place it into a well floured, linen-lined, flat-bottomed basket. Proof, covered, for 1.5 – 2 hours, until the indentation left by the light press of a fingertip springs back very slowly. Just before baking, slash the miche (this not necessary with the spiral top). Once the miche is in the oven, reduce the temperature to 450F. 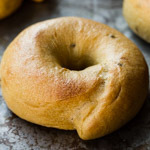 Bake for 10 minutes with steam, and another 50 minutes or so without steam. The crust should be a very dark brown. Then turn off the oven and leave the miche in for another 10 minutes, with the door ajar. What size rising basket did you use? I’ve got a pair of 9 inch brotforms but I’m looking at buying a larger one for special occasion baking. Susan, what an ingenious idea! I have to try this one, cause it looks spectacular! I love every minute spent on your blog! Remember my nightmare about miches? 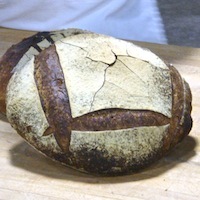 I got over it, since you posted that video with shaping a boule. I practiced a lot, and I’m getting better. Thanks! 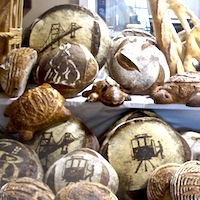 Beautifull breads, all of them! 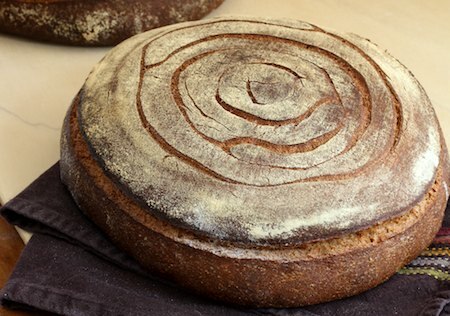 what a beautiful rustic-looking bread! 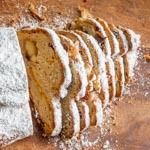 I will so definetely try this as soon as my sourdough looks ready (still working on it). do you think it would work even with a regular plastic bowl (covered with a linen towel) rather than a basket? I love the look that the spiral dough gives to this miche. 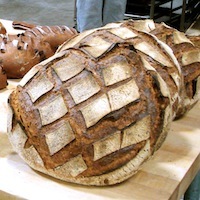 What a great idea to Form a nice pattern on the Bread! That’s pretty cool! I need to try this technique. I also love all of the stenciled designs. Wow. That is a work of art! You are the master. I have a miche on tap for September, with the Mellow Bakers. Maybe I’ll try your spiral technique. Indeed, a masterpiece in form of bread! The spiral technique is amazing! This bread looks amazing. That technique is really lovely. I would love to try something like this. You have inspired me! Thanks. 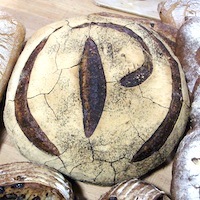 Amazing!… seems to be the theme of the sentiments expressed about this great miche, and I concur. Truly artistic! 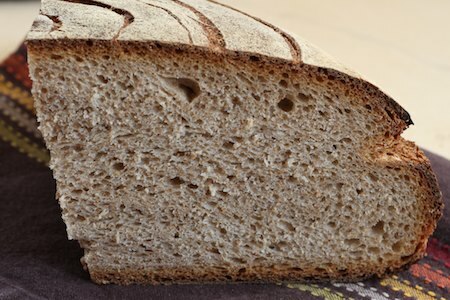 What is whole wheat starter? and how do you make it? I made this today–my loaf not nearly as shapely as yours, but it is really delicious! Can you tell me why this bread doesn’t have an autolyse period (and is this the reason why the salt is added at the same time as everything else, not after the autolyse)? Thanks for miche Article…. 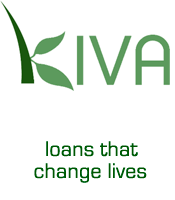 you have a good knowledge!! Your blog is inspirational, I really like it. 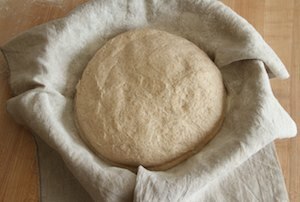 I a a newcomer to blogging but not to bread making. 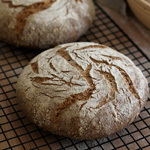 I have been regularly baking a “la Miche” for some time now, its such a reliable no fail bread, healthy too. 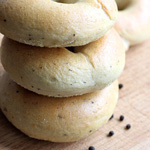 I love your idea of coiling up the top portion of dough, the loaf looks great! I cant wait to try this is my kitchen. 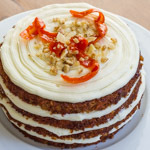 I am also excited to have look through your other recipes. thank you! !